A critically endangered species of monkey stolen from a zoo has given birth to healthy twins. 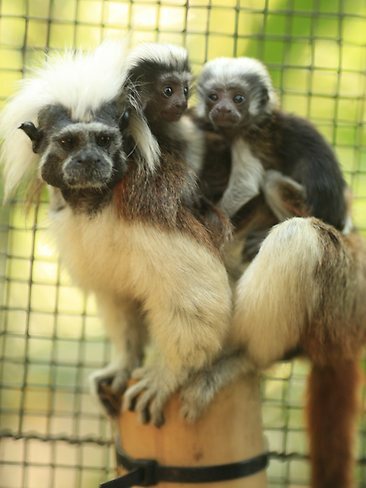 Mamma, a cotton-top tamarin, was one of five monkeys taken in a planned raid atBlackpool zoo in April when thieves cut a hole in a perimeter fence and removed the locks from two enclosures. Four of the primates, including two female cotton-top tamarins and two male emperor tamarins, were recovered days later in Yorkshire but the fifth, another of Mamma's offspring, was not found. After they were stolen, Lancashire police said they believed the monkeys were targeted specifically and warned ports and airports in case the thieves tried to take them abroad. The cotton-top tamarin is considered one of the world's most endangered primates – and is one of the smallest. There are said to be about 6,000 such monkeys left in the wild in their native Colombia, with numbers largely reduced through deforestation. Blackpool zoo says Mamma must have been in the early stages of pregnancy when the theft occurred. Charlotte Pennie, senior primate keeper, said: "Keepers at Blackpool zoo were devastated earlier this year when five of our monkeys were stolen as every single animal we have here is considered a member of our zoo family. "We worked very closely with Lancashire police and following huge media interest four of the five were found days later. "The two new babies, who are yet to be sexed and named, are doing extremely well and we are delighted. The pair are also vital for the international breeding programme so it is great news all round." No one has been arrested over the break-in.